I was a bit surprised when this game was announced. That’s not because I’m foolish enough to think Bakugan games won’t sell or that the first game wasn’t good enough to warrant a sequel. 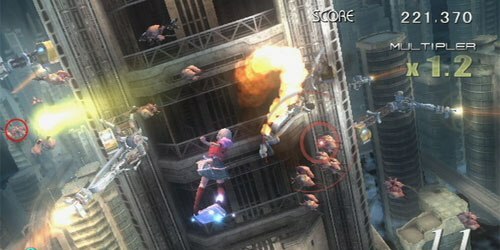 However, this game was released a mere five months after the last game. That’s pretty darn fast. I had enough fun with the first game that I though it would be cool to grab this and review it. All they had to do was tweak a few things and it could have been a great DS game. However, after a trailer or two for Battle Trainer was released, it became clear that this would be a different type of game all together. This kind of thing happens frequently with licensed games, so I wasn’t too surprised by that. Even with a new developer at the helm, I figured this would be a safe buy. Was my faith rewarded, or did they screw the pooch on this one? This time around, you’ll be playing as Dan. It starts off with him losing his memory for no apparent reason. However, this isn’t really a plot device. Instead, it is meant only so that when Marucho explains the basics of the game to you, it doesn’t seem odd. What it boils down to is that a strange space ship has appeared above the earth and sucked all of the Bakugan up. The Brawlers have teamed up with a Professor Trevoc in order to find a way to get aboard the ship and set things right. As it turns out, only Dan is able to go back and forth between the ship and earth, and he only starts off with one Bakugan. It’s up to him to rescue the Bakugan and thwart the evil plot of the Guardians. It’s pretty straight forward this time around. There’s very little dialogue, and no real characterization. The big twist at the end can be seen from a mile away. It’s nothing offensive or bad really, but it doesn’t go anywhere either. Heck, most of the characters from the show don’t even appear, or have only a couple of lines. It’s nothing to get excited about. This wouldn’t be so bad if there were extra modes to play around with. However, there isn’t. There’s no free play mode, no store to buy new items, or even multiplayer. The latter is an absolute crime for a Bakugan game. This time, you only have the story to play, and it isn’t up to the task of carrying an entire game on its shoulders. The graphics in Battle Brawlers was one of the best aspects of the game. They were bright, well animated, and gave you some really nifty locations to look at. Sadly, this isn’t the case here. You get one “arena”Â in the game, and that is simply a top down area where you train your Bakugan. It’s a plain area with a few colored sections for each attribute, and no real effects. The battles this time around are nothing more than immobile sprites on a flat background with no effects. The only good thing about the game are the battle animations that show up on the top screen. Why are these good? It’s because they were stolen from the last game. Still, it is nifty to watch Laserman blast away or Sirenoid slither around. I just wish the rest of the game looked as good. This isn’t to say the game looks all that bad. There just isn’t much to it. The training minigames are mostly the kind of thing I could make on Fyrebug with little to no effort. It doesn’t take advantage of what the DS is capable of. Much like last time, the music is generic rock fare that sounds good enough for background music, but doesn’t do anything remotely interesting. It works fine for the game, but you won’t remember it after you’ve turned the DS off. Once again, there are several voice clips performed by the actors from the show, though Dan did sound different to me. Even still, there are perhaps half a dozen characters that get any voiced lines, and they only have a few clips that are played repeatedly. It isn’t bad by any means, just another aspect of the game that feels pedestrian. The sound effects do their job, but because of how the game plays, there are significantly less of them. The roars and screeches of the Bakugan are cool yet again, certainly better than the tired noises that Pokemon make, but that’s about all you can say. The audio isn’t bad, and it certainly works for the game, but don’t expect to be impressed by it. Talk about taking a huge step backwards. There are two aspects to this game: training and battling. To train a Bakugan, you must head to the training facility and select one of your Bakugan on the field. You first need to build up their mental power. 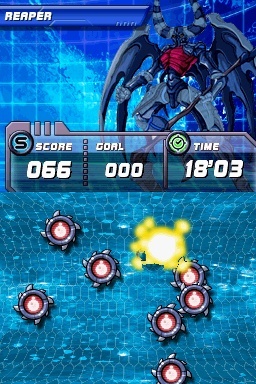 You do this by either collecting batteries on the field, moving the Bakugan to its respective attribute corner, or by playing a short minigame. 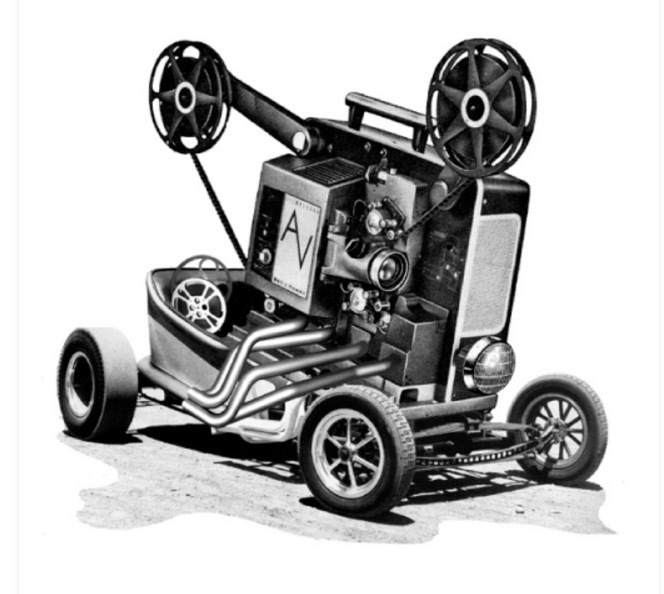 The mingames are simple fares like answering trivia, blowing into the mic, or flicking the stylus in rhythm. These don’t take much time, and it is easy to build up the mental power meter in a few seconds. If you don’t want to play them, you can simply leave the Bakugan in its corner and it will build up eventually. Once you’ve built up the mental power, you can play a training game. There are five of these, and they are unlocked as you level up a Bakugan. 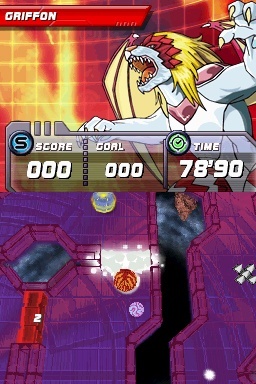 These include moving your Bakugan through a maze to find points, blocking oncoming projectiles, tapping point tiles before they disappear, avoiding obstacles as you move down a track, and a simple gem dropping game. 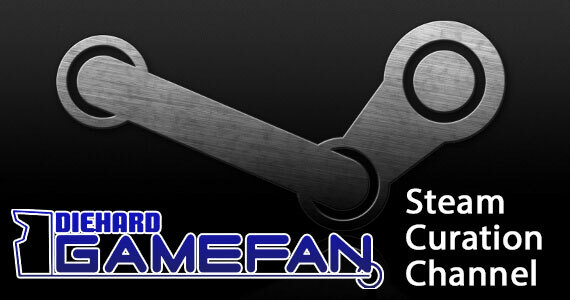 The goal of these games is to obtain a set amount of points before time runs out. 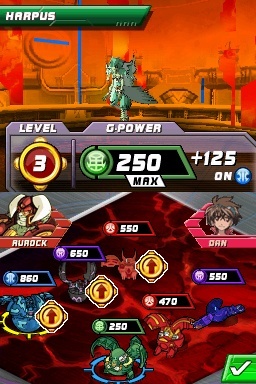 The point amounts and complexity of the game increase with the level of your Bakugan. Winning grants your Bakugan GP, but only up to a cap set by its level. It also increases your bonus against the attribute that your Bakugan is strong against. 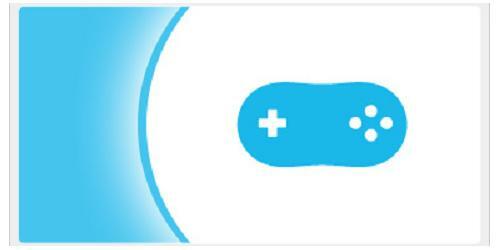 You earn the same amount of points no matter what game you play, but you can earn bonus points if you best your high score. Otherwise, there isn’t a reason to try after you’ve passed the required mark. Completing these games also gives you actions you can use in battle. Each Bakugan can carry five actions. Even if you’ve maxed out your GP, you can still play to try and earn better actions for your Bakugan. What are these actions used for? Well, battle this time doesn’t require cards or throwing your Bakugan. Instead, you pick your three man team and face an AI opponent. You can view which Bakugan they have and their power, as well as the attribute bonuses for that arena. Once in battle, you find a simple turn based strategy game. You first select which Bakugan you want to use and then pick one of your opponent’s Bakugan to battle. You each get to play up to two actions in turn in order to get the most GP. Whichever Bakugan has the most wins, but has the losing Bakugan’s GP subtracted from its total. The computer then selects another of its Bakugan as well as one of yours. This process repeats until one player is left without Bakugan. You can gain levels by defeating a Bakugan with an arrow icon hovering over it. There is a lot more strategy this time. You have no stylus minigames to boost your GP, nor do you have cheap action cards or gate card bonuses to rely on. You only have your base GP and your hand of actions. Actions range from simply adding to your GP to causing effects such as tripling your next bonus, canceling a bonus, or even swapping GP with your opponent. You can have a strong base GP, but if you don’t back that up with a good hand of actions, you’re probably going to lose. You also have to worry about attributes. Each attribute has another that it is strong against. Darkus is great against Haos. Subterra is great against Ventus. When one type goes against the type it is strong against, the opposing type loses a ton of GP. In some cases, it can drop them to zero, causing an instant victory without having to play actions. Also, victorious Bakugan tend to have significantly lowered GP scores, making them great targets. Still, a proper strategy goes a long way. On several occasions, I was able to make a comeback with only one Bakugan and even clear the field using the same Bakugan for every battle. It all boils down to how well you’ve set up your team to deal with the battle and how you play your actions. Overall, however, the gameplay is a huge letdown. It doesn’t emulate the show or game at all. The turn based gameplay can be fun and certainly strategic, but it is simple. There are no tag team battles or battle royales to play. There are only four opponents and they have no differences, as the Bakugan they use aren’t character specific. The training games aren’t very fun, and take too long to get challenging. I’d say it’s decent enough on its own, but it isn’t what you would want from a Bakugan game at all. This is where the game takes the biggest hit when comparing it to the last game. The story will only take you about four to five hours to beat. When it’s over, you’ll already have all of the Bakugan in the game. There aren’t any other modes to play, no multiplayer, and no post game activities. There aren’t even multiple difficulties. All you can do is replay battles to level up your Bakugan. There isn’t any reason to do this because there’s nothing to use them for after you’ve bested the boss. So, even if you spend the time to level up all of your Bakugan, which there isn’t any reason to do, you won’t get even ten hours out of the game. That’s just sad. I managed to beat the game without losing even once. I even managed to crush the final boss only using Laserman. However, the game is still much more challenging than the last game. Because winning Bakugan lose power, it offers a way for even your toughest Bakugan to be bested if you don’t play your actions right. Also, if you don’t spend at least some time playing the training games, you won’t have good enough actions to pull off the victory. You have to put some time and effort towards training in order to win. The training games do eventually get challenging in that they become far easier to fail. Still, I found that the gem dropping game and the tapping game were easy enough to pass without much problem. There never seemed to be much of a difference in what kinds of actions you’d win no matter what game you play, so if you find a game you can win at every time, it becomes a breeze to train. Even if you fail, the only setback is that you lose some mental power and have to earn it back. That only take a few seconds. It’s an easy game, but it isn’t mind numbingly easy. That, at least, is a step in the right direction for the series. The idea of collecting monsters and training them for battle is certainly nothing new. Nor is the concept of turn based strategy. Battle Trainer clearly has its roots set in come classic design choices. Still, the strategy behind combat feels novel enough that you don’t feel like you’re simply playing a straight up clone of another game. Also, being only the second Bakugan game on the market keeps it from feeling as overly familiar as say a Dragonball Z game would. So, while it won’t win any awards for originality, it isn’t completely devoid of it. I pretty much played the game in two shifts. In the first shift, I played through about seventy five percent of the game. The only reason I didn’t finish it all at once was because I decided to sleep for a few hours. Even though the game was pretty short, I still found myself glued to it in some ways. The main thing that will keep you going is earning new actions and experimenting with them in battle. When I mentioned how I defeated the final boss using only Laserman, that was because I focused a lot of attention on getting his actions just right for some sweet combos. I chose to fight an Aquos Bakugan so I could use a special action that gave me a huge bonus against Aquos characters. I made sure I took enough damage that the computer would target me next. After that, I waited to spring an action that caused me to swap power levels with his best Bakugan, not only clearing him off of the board, but giving me just enough strength to finish off his last guy. None of that would have been possible if fiddling around with a Bakugan’s hand of actions wasn’t addicting. It isn’t as addicting as something like Bejeweled, but there’s enough here to keep you interested until the game ends. If only that wasn’t so short. Once again, this game has a lot going for it simply because it is a Bakugan game on the most popular gaming system on the market. As such, this game has a fairly large market. However, there are other factors that eat away from this advantage until it is nearly eradicated. Firstly, the last Bakugan only came out five months ago and is still widely available. Not to mention, you can get it cheaper. It doesn’t help matters that this game isn’t as good as that one. 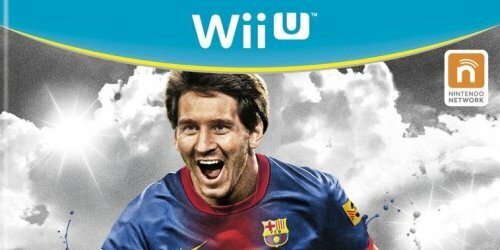 This game doesn’t have multiplayer, wireless or otherwise. For a game based on a popular mutliplayer game, this is an unforgivable sin. The timing of this game’s release also coincides with that of Pokemon Heart Gold/Soul Silver. A lot of this game’s target audience will still be playing that, or simply not have the money to get both. There’s also been almost no hype towards this game’s release. It kind of just appeared on shelves. All of that adds up to make this game a tough sell, despite its strong license. There’s not much to talk about in this section. There aren’t any extras that come with the game in any sense. There’s not even a special Bakugan like in the last game. You get the story, and that’s it. I would like to talk a bit more about how much of a disappointment this game is. While it is clear that a different developer worked on this game and that it was probably being made the same time as the other games, that’s still no excuse. Every single aspect of the game is lessened by a lack of content. The presentation is bare bones, the gameplay is nothing like the real thing, and there’s only one mode. That just isn’t acceptable. It will certainly make me hesitant to pick up any future games in the series. 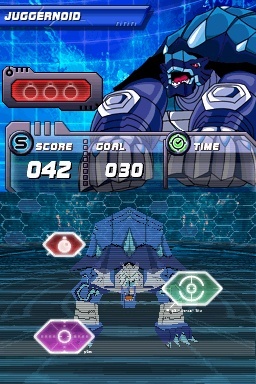 Bakugan Battle Trainer isn’t bad, but it doesn’t do itself any favors. The amount of content is severely lacking. The adventure is short and not worth playing again. Even the presentation is a big step down from what the last game did. Worse off, there is no multiplayer element in a series designed for it. If you like Bakugan, you might find some amusement in it, but anyone just mildly interested will not be entertained. 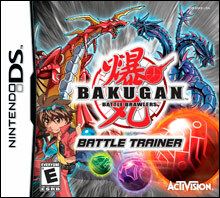 Hopefully, the next game will make the proper adjustments and deliver a proper Bakugan gaming experience.